The bitter winter fighting for Budapest was one of the most prolonged, vicious city fights in history. And, until now, no one has ever tried to make a game to capture the struggle. Late December, 1944, while the Allies began to pinch off The Bulge, the Soviets—and their new-found Romanian allies—began the assault on the “twin cities” of Buda and Pest, where 79,000 surrounded Axis defenders held on against heavy odds, made more difficult by “high command” orders to defend everywhere and not to consider a breakout effort. With German mobile reserves and stockpiled supplies expended by the Wacht am Rhein, a mixed force of Germans and Hungarians held on with little hope of relief. By mid February, after the city fell, less than 1000 Axis troops of all kinds made it back to the dwindling safety of German lines. 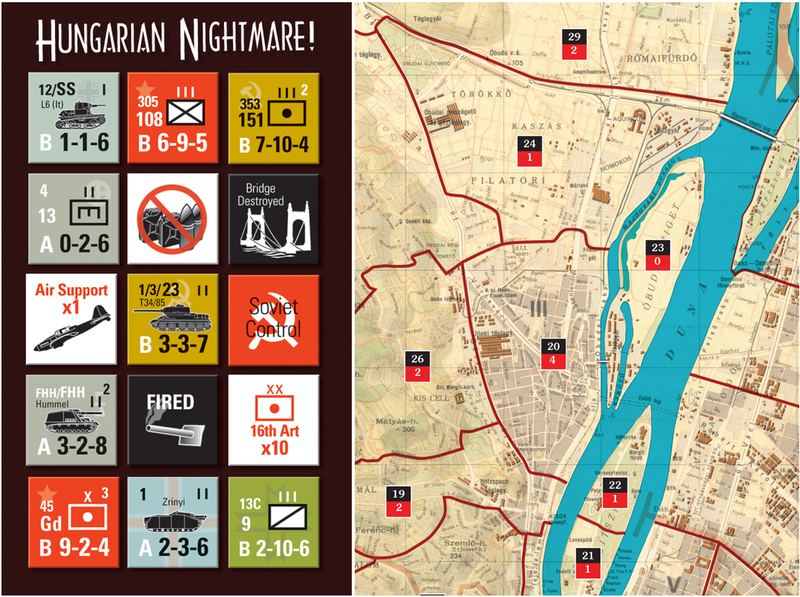 Hungarian Nightmare puts you in the difficult command situations for both sides. The Soviets have two full “fronts” worth of troops, plus a corps of their newly gained (and doubtful quality) Romanian troops, while the Axis player commands a hodge-podge of various unit types of widely ranging enthusiasm. 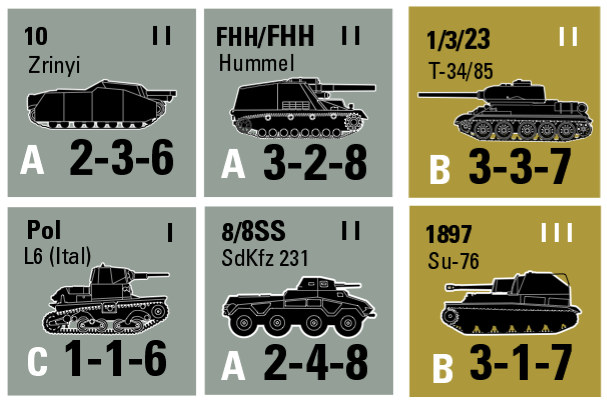 German units include remnants of two SS cavalry divisions, panzer kampfgroups, rear-area units, and strays, while Hungarian units are even more diverse, with everything from assault gun companies to police units and WWI veterans, with some troops ready to hold on to the bitter end and others looking for an early opportunity of melting away. The Axis player struggles with dwindling fuel, supplies, and manpower energy, while the Soviet player competes with a difficult time-table and the loss of key units to repel relief efforts. Designed by Mark Stille (Wintergewitter, Imperial Sunset, North Wind Rain), Hungarian Nightmare offers 400 counters, an area-movement map of the cities, with each space about one square kilometer, and three-day turns that cover the entire, brutal campaign. For the first time in gaming, the assault on Budapest is yours to make or to fend off. Map - Two full color mapsheets for a 33" x 34" playing surface. Download the Hungarian Nightmare rulebook (in PDF format). Download variants and ideas to have even more fun with Hungarian Nightmare (in PDF format).